The New Globe Theatre Stage Picture will bring the history of the Globe Theatre to life. This picture illustrates an important aspect of the Elizabethan theatre during the period of William Shakespeare and the original Globe Theatre. Our Picture of New Globe Theatre Stage provides an idea of what this famous theatre looked like. The theatres in Elizabethan London were exciting venues for staging the plays of William Shakespeare. The Elizabethan Theatres started in the cobbled courtyards of Inns, or taverns - they were therefore called Inn-yards. It was the idea of James Burbage to construct the first of the purpose-built Elizabethan theatre. The massive open-air arena styled theatres were only open during the summer months. 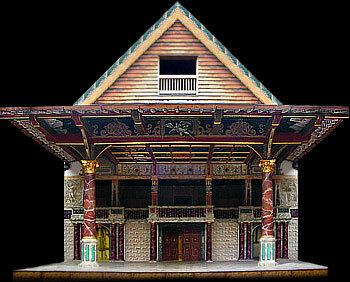 Winter venues were established called Playhouses providing new indoor Elizabethan Theatres. Interesting Facts and information about the New Globe Theatre Stage Picture. Additional details, facts and information about the Globe Theatre can be accessed via the Globe Theatre Sitemap.